Finally. I have broken the 200 mile barrier. 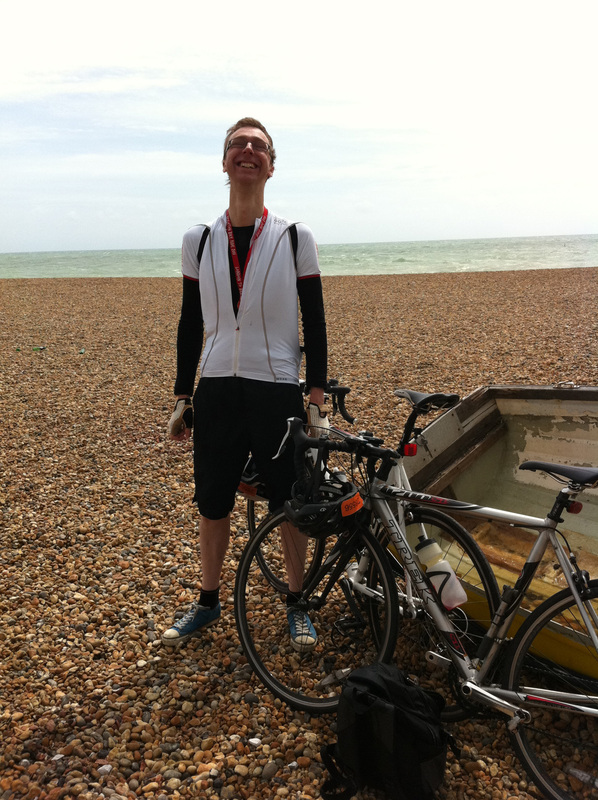 208 miles in total this month, thanks mostly to cycling from London to Brighton for the British Heart foundation. After that, there’s not much progress thanks to what seems like two weeks of rain. The day of London to Brighton arrives, and the sky has a very English summer mix of bright blue patches and big white clouds, racing high over the city. I cycle to the Clapham Common start point to meet friends and colleagues from work, wearing the special jerseys the company has got us for the day. Jon Lipsey, the editor of Men’s Fitness and our team leader, recommended lots of wholemeal and carbs as preparation, so I made myself a bread and butter pudding and stuffed myself with it the day before. Not entirely sure it’s what he had in mind, but I survived the ride so it obviously didn’t hurt. It’s an amazing ride, tricky at the start because there’s so many riders (and there’s still London traffic to cope with), but interesting and surprisingly rural. There’s a great atmosphere, small villages with children clapping, bunting out on the way, and a real finish with people lining the seafront. Crashes and congestion, too. And of course, at the end, there’s the Ditchling Beacon – a terrific climb, steep, twisting and tricky, and the whole time I am remembering the Lance Armstrong quote: pain is temporary, failure lasts forever. Naff, but I make it to the top without putting my feet down, the sense of achievement thrumming through my whole body. Then it’s blasting down towards Brighton, and the sight of the sea. After a long, lazy lunch, we catch the bus back to London, and then I cycle home. By the end of it, I’d done 74 miles and feel ready to drop. Still, throw in eight commutes (96 miles on their own! ), and the BHAG is looking there for the taking. This entry was posted in Cycling and tagged BHAG, charity. Bookmark the permalink.